It is possible to edit images that you have uploaded to Cascade. As long as you only need to do basic image manipulations, you will be able to use Cascade instead of purchasing specialized image-editing software, like Photoshop. Remember that the file name of your image file must have the correct file extension. Some file name extensions used by images are .jpg, .jpeg, .gif, .png, or .bmp. To edit an image that is already in Cascade, use the following instructions. If you need to upload a new image, see the instructions on the "Uploading an Image" page. 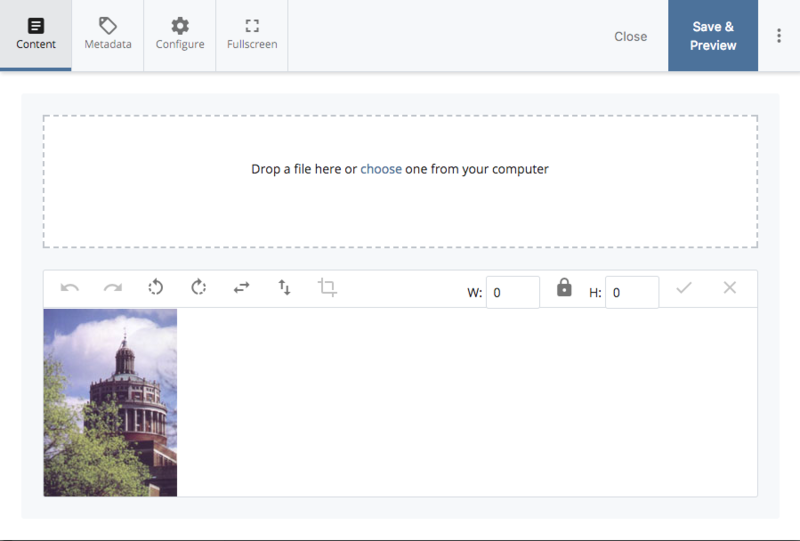 The image editor has a toolbar with icons for all of the basic image manipulations, as shown in the screen shot below. For standard image sizes see our web style guide. The width and height fields are for the dimensions of the image in pixels. To resize, enter a new value in either field and then click the Apply Resize check mark just to the right of the height field. By default, the aspect ratio of the image will be preserved, so that the image will not be distorted. However, if you need to stretch the image, you can click the link icon in between the width and height fields so that the aspect ratio will not be preserved. To crop, drag your mouse across the image to select the part of the image that you want to keep. If you hold down the Shift key when you drag, the aspect ratio will be preserved. After selecting the cropping area, you can modify it by dragging the handles at the corners or edges of the area boundaries, and you can move the cropping area around by dragging it with the mouse. When you are satisfied with your cropping selection, click the cropping icon in the toolbar.